The coins are offered by the US Mint as the last of five 2012-dated strikes as part of their respective series. 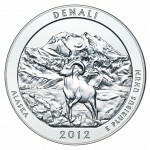 Both feature reverse designs emblematic of Denali National Park located in the state of Alaska. 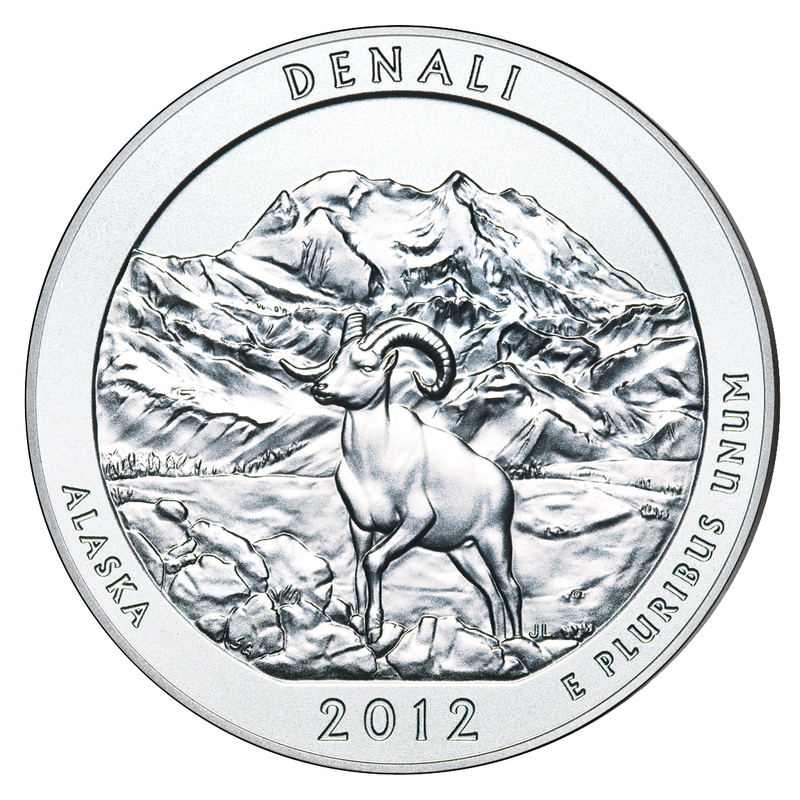 According to the US Mint, the reverse design "depicts a Dall sheep with Mount McKinley rising in the background. Inscriptions are DENALI, ALASKA, 2012 and E PLURIBUS UNUM. The reverse was designed by AIP Master Designer Susan Gamble and sculpted by United States Mint Sculptor-Engraver Jim Licaretz." Five different Denali National Park Quarter products make their debut today as part of the US Mint's America the Beautiful Quarters® Program. 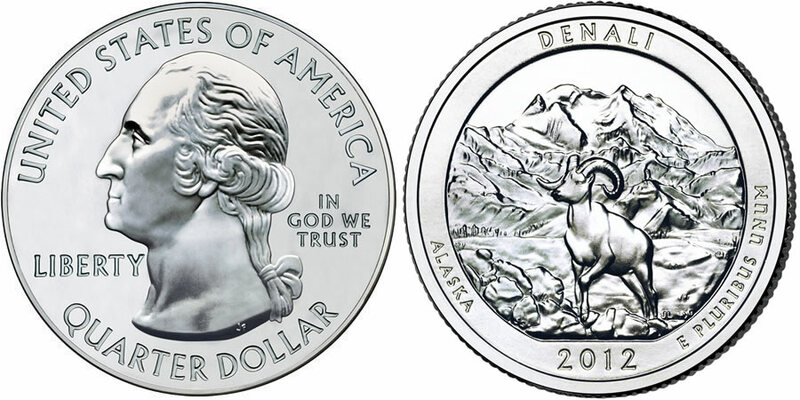 All five of the products contain circulation quality Denali Quarters struck at one of three US Mint facilities. A majority of the products are from the US Mint's facilities in either Philadelphia (P) or Denver (D) . These are the same locations responsible for the circulating coinage of the United States with examples of these coins likely to make their way into your pocket-change in the future (The Federal Reserve Bank System released them for circulation today). In addition, the US Mint will also be issuing two new products which contain circulation quality coins struck at the US Mint's facility in San Francisco (S). These products were created exclusively for numismatic purposes and thus will not likely be seen in actual circulation. In addition to the above pricing, the US Mint also adds a shipping and handling charge of $4.95 per order. 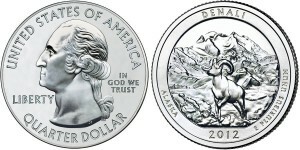 The 2012 Denali Silver Uncirculated Coin is issued as part of the US Mint's America the Beautiful Five Ounce Uncirculated Coin™ series. This series was created by the US Mint as the numismatic versions of the America the Beautiful Silver Bullion Coin™ program. Each of these coins is struck from five ounces of .999 fine silver to uncirculated quality. They can be differentiated from the related bullion coins by the inclusion of a 'P' mintmark on their reverse indicating they were struck at the US Mint's facility in Philadelphia. The bullion coins are also struck in Philadelphia but contain no mintmark. Pricing of the coins is listed by the US Mint as $229.95, plus the $4.95 per order shipping and handling charge. The US Mint may adjust the pricing of these coins based on silver market activity. Mintage of the release is capped at 25,000.